Experts report that wrong-way crashes are becoming more frequent on Miami, Florida highways. With traffic gridlock increasing, with the city becoming more urbanized, city officials are having trouble maintaining roads and fixing roads to prevent wrong-way accidents. Among the many causes of wrong-way accidents, poor signage and roadways that fail to properly direct traffic are noted. The New Times reported on a study performed by the Florida Department of Transportation that found that among the wrong-way accidents that took place in Florida, 21 percent were in Miami-Dade. Worse, the alarming frequency of these accidents, puts more drivers at risk of death and injury. According to one study, wrong way accidents are 100 times more likely to be fatal. USAttorneys.com recently reported about a wrong-way driver who crossed a median, leading to five deaths. The accident also left two people seriously injured. 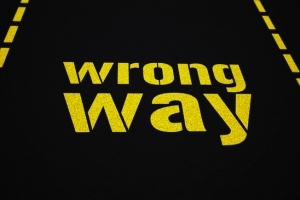 In many cases, wrong-way accidents occur due to another driver’s error. Yet, is there anything Miami, Florida drivers can do to prevent the deadly and serious effects of these devastating accidents? Our Miami car accident lawyer offers four things you can do, if you face a wrong-way accident. Put on your turn signal to let the driver know where you plan to go. Many wrong-way accidents occur because a drunk driver has drifted to the wrong side of the road and is unaware of his or her mistake. The problem gets compounded when the sober driver reacts to the drunk driver. There is always a risk that both drivers will turn in the same direction to avoid each other. Drivers should put on their turn signal to indicate to the other driver where they intend to go. While this isn’t a surefire way to prevent all accidents, there is a chance that the other driver will see where you’re headed and turn the other way to avoid you. Check the reflectors on the road. If someone is heading toward you, it may be you who has made the mistake. White or yellow reflectors indicate that you are on the correct side of the road. Red reflectors indicate that you are on the wrong side of the road. Scan the road ahead. The sooner you see a hazard, the more time you’ll have to avoid it. Take your time to carefully scan the road ahead for wrong-way drivers, especially when you’re on a two-way highway. In some cases, accidents can be avoided by just pulling over. Pull over. Don’t play chicken with your life. If you see a wrong-way driver up ahead and the driver doesn’t seem to notice you, pull over to the side of the road in as safe a manner as you can. Slow down before driving off the roadway, though. Hitting gravel or uneven surfaces at high speeds can cause your car to flip over. Miami lawmakers need to take action to make wrong-way driving less likely on south Florida roads. Drivers also should avoid drinking and driving and driving while they are sleepy. If you or a loved one has been hurt in a car accident, contact the personal injury lawyers at the Wolfson Law Firm, L.L.P. We’re here for you and your loved ones.